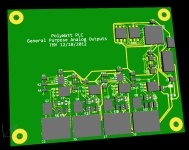 The PolyWatt PLC is a set of five small circuit boards, 4.5 x 3.5 inches which can be combined in different ways for a high performance network centric programmable logic controller (PLC). 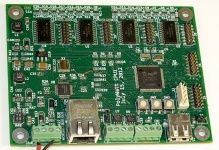 These five boards include a main CPU and optional high speed comparator, digital inputs and outputs, and high resolution analog inputs and outputs. The network centric features include a web server that can be accessed by any browser such as that running on an I-Pad or intelligent phone. Any number of controllers for different purposes can be constructed and networked together using Ethernet, RS485, or CAN networking making large low cost scalable control systems a simple proposition. Since most design elements and circuit schematics will be in the public domain there will never be the problems that are inherent with the proprietary PLC designs of the past. The large free library of software routines for the MicroChip PIC32MX795F512L make short work of any coding task. The Fir, an old Coast Guard bouy tender is being upgraded with a polywatt PLC system. For more on this project click here. 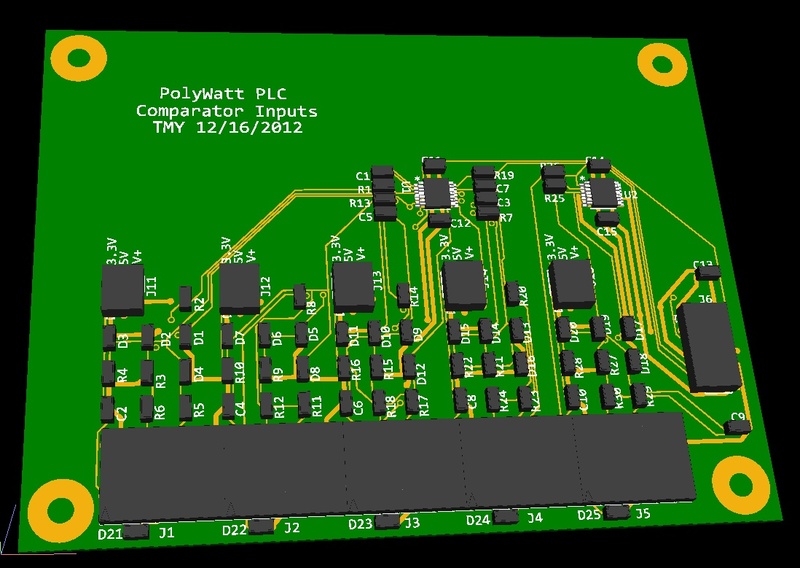 4 layer printed circuit board. Two on-board switching power supplies allowing a wide power input range, 5vdc to 50vdc. One supply is for all local circuits, the other is adjustable from 5vdc to 45vdc for user applications (V+). 1- USB connector for general purpose use, or programming if a boot loader has been previously programmed into the CPU. 1- 5 pin header compatible with Microchip programmers such as the ICD2. 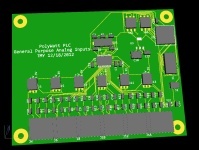 1-14 pin header for local serial bus to analog input/output boards with included user V+, Gnd, +5vdc. The total number of serial addresses available are 16. 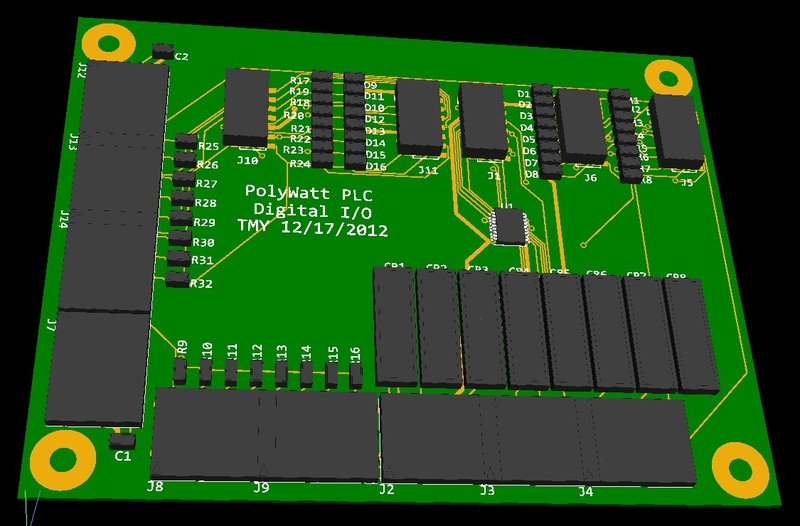 4-14 pin headers with 32 programmable 5 volt digital inputs and outputs. Also included on these headers is the user V+, Gnd, +5vdc. A large assortment of leds and switches suitable for simple checking and status monitoring. 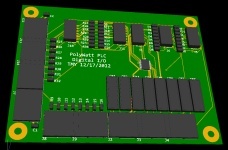 This original prototype board is being replaced by a newer design now under construction. Six channel synchronous sampling allows for three phase power line voltage, current, and phase monitoring and control. 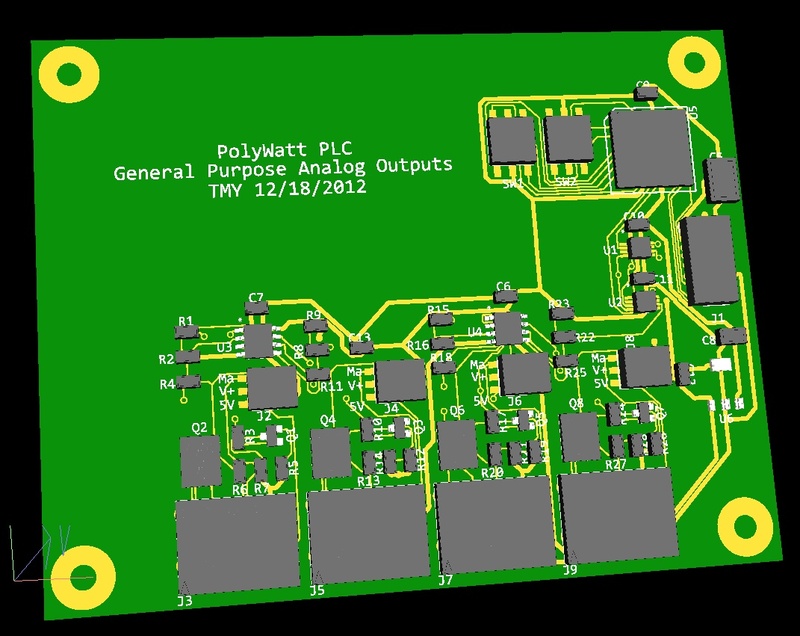 Programmable gain amplifier on input allows direct connection of thermocouples, strain gauges, and other low level inputs. Can drive the CPU with an interrupt when conversion completes. Several voltages available on terminal blocks make for simple powering of many sensor types. On board temperature sensor can be used for thermocouple cold junction reference. Serial interface address is adjustable allowing for multiple analog input boards with one CPU. Each board uses 2 addresses, one for the A to D and one for the temperature sensor. The temperature sensor can be disabled. First prototype currently under construction. 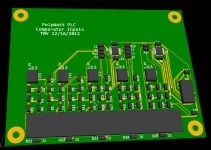 2 layer printed circuit board. 4 analog outputs with various selectable voltages on the terminal blocks. Uses two Microchip MCP4822 digital to analog converters and a power amplifier output scheme that allows for single ended current or voltage outputs up to the user V+. 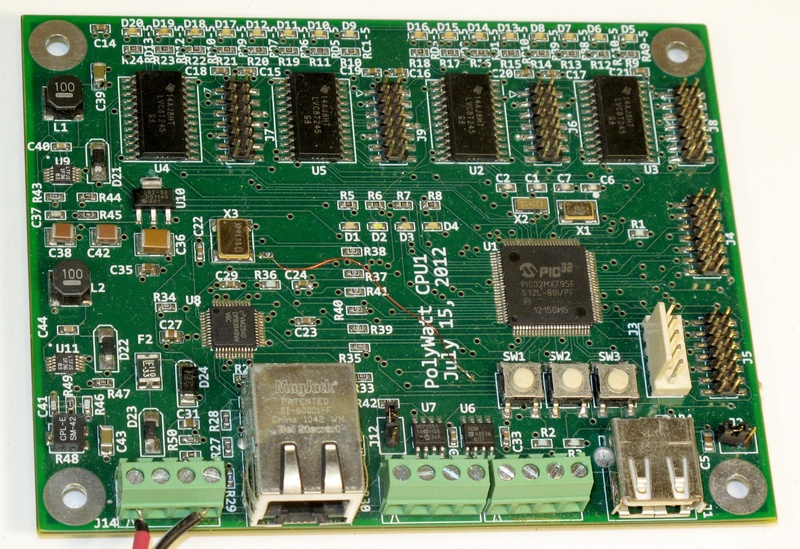 Serial interface addresses are adjustable allowing for multiple analog output boards with one CPU. Each board uses 2 addresses, one for each D to A. Well suited for quadrature magnetic speed sensors such as typically used for engine or motor RPM. All inputs can be used as interrupt sources to the CPU for high speed counting. 8 relays. Contacts 0.5 amp, 200 Volts. Group of 8 high speed inputs or outputs. Input or output under program control from CPU. Outputs are 5 volt TTL. Inputs can be 5 volt or 24 volts depending on connector to CPU used. A second group of 8 high speed inputs or outputs. Input or output under program control from CPU. Outputs are 5 volt TTL. Inputs can be 5 volt or 24 volts depending on connector to CPU used. More than one digital IO board may be used with one CPU but the maximum total inputs or outputs is 32. You could use 4 boards for a total number of 32 relays for instance.